One of the fastest growing airlines in the world, Emirates is an award-winning airline that’s been picking up numerous prizes since 1990, continuing its winning streak right up to the present day. With a dedication to safety and innovation, alongside impressive levels of customer service and care; it’s easy to see why Emirates is one of the most highly regarded airlines around. With an ever-expanding fleet of more than 200 aircraft, flying to more than 160 destinations in more than 80 countries, this constantly expanding network sees more than 1,500 flights depart Dubai each week to six continents across the globe. Emirates currently offers flights to Dubai from eight UK airports: London-Gatwick, London-Heathrow, London-Stansted, Glasgow, Newcastle, Manchester, Birmingham, Edinburgh. For travellers wishing to explore the Middle East from the world over, Emirates is ideal. 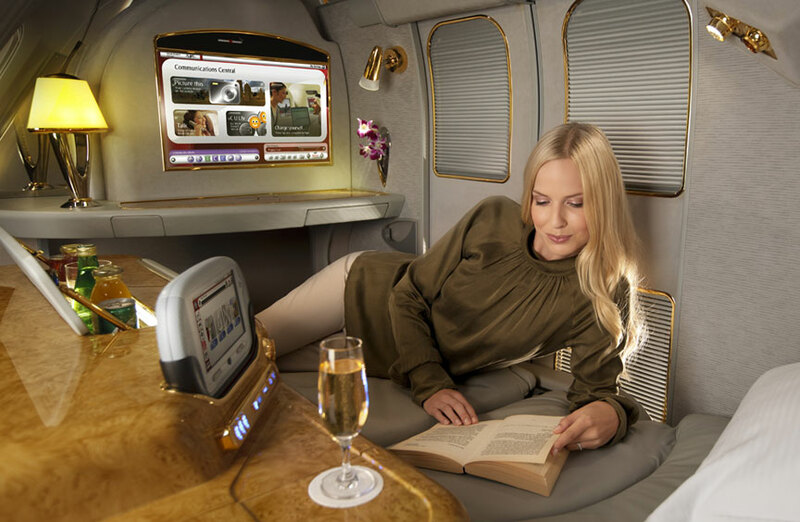 Emirates guarantee an exceptional level of service to passengers, whether at economy, business or first class level. The cabins are specially designed to maximise the space available to each traveller, demonstrating their commitment to producing the most comfortable flying experience. Emirates cabin crews are multilingual and many newer planes have in-flight mobile technology to enable you to stay connected. Each seat is fitted with ICE, the Emirates in-seat entertainment system, which contains over 1,000 channels, music, video games and the ability to access emails. 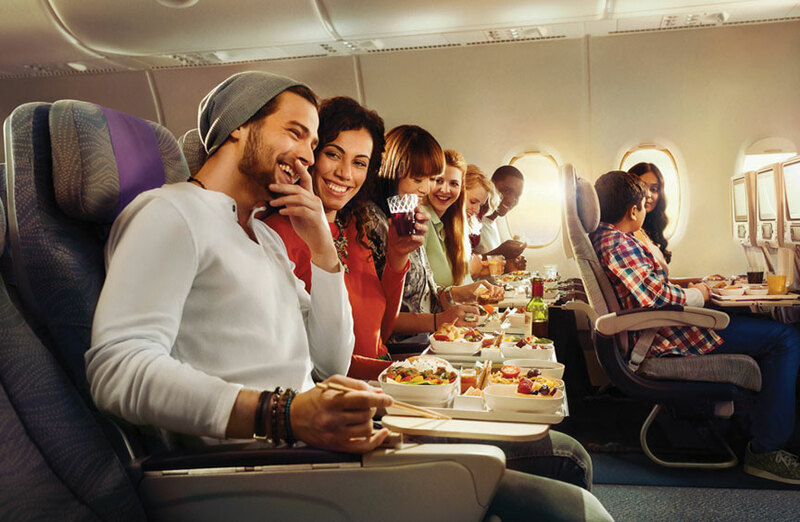 With a generous baggage allowance of up to 35kg, ergonomically designed seats with adjustable headrests and up to 34-inch seat pitch, as well as regionally inspired gourmet cuisine served with a selection of complimentary beverages, Emirates Economy Class offers an experience in a class of its own. Sit back and relax enjoy over 2,500 channels of entertainment on-demand from every seat and stay connected with onboard Wi-fi*. Plus, with kids’ meals, toys and entertainment, your little travellers will be happy travellers! Stretch out and relax in comfort with Emirates Business Class. Explore the world through regionally inspired dishes and join the conversation over fine wines in the A380 onboard Lounge. Travel from your doorstep in comfort as you enjoy a complimentary Chauffeur-drive Service**, take advantage of priority check-in, baggage handling and exclusive airport lounges. 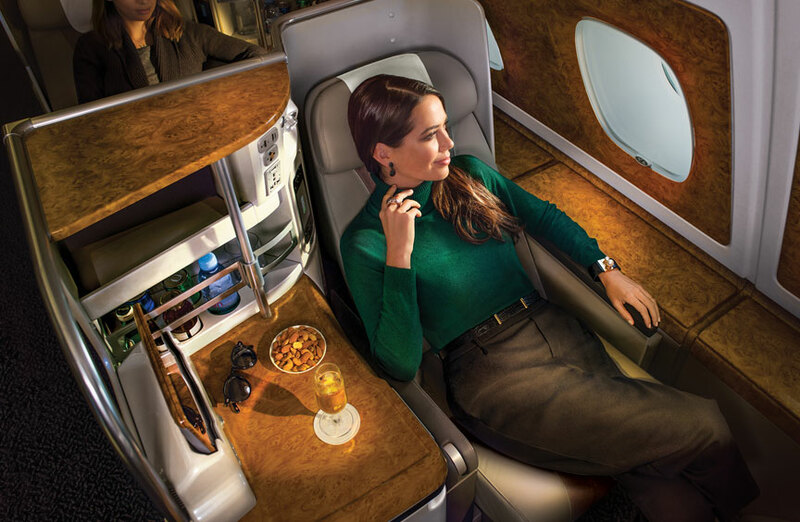 Arrive revived, relax in lie-flat beds with massage function (on all A380 aircraft), enjoy hours of entertainment on your personal 23-inch entertainment screen, luxuriate with stylish Bulgari amenity kits, and of course, multi-course gourmet cuisine served with fine wines. Arrive inspired in First Class. Unwind in your own Private Suite, rejuvenate in the A380 Shower Spa and savour fine dining served whenever the mood takes you. Fly First Class and make every journey your own. Your Private Suite features total comfort with a flat-bed and sliding door for total privacy, enjoy the personal in-seat mini bar, unwind with Bulgari amenity kits, slip into the world’s first moisturising sleepwear for the skies with Hydra Active Microcapsule Technology and experience personal dining service and fine wines. One bag is permitted, not exceeding 7kg weight or dimensions 55 x 38 x 20cm. The hand baggage you may take on the plane depends on which class you’re flying. Both First and Business Class customers can bring two pieces of carry-on baggage: one briefcase and either a handbag or one garment bag. The briefcase can’t exceed 18 x 14 x 8 inches (45 x 35 x 20cm), the handbag must be 22 x 15 x 8 inches (55 x 38 x 20cm) maximum, and the garment bag may not exceed 8 inches (20cm) thick when folded. The maximum total combined weight of both pieces of hand luggage can’t exceed 30Ib (14kg). Those in economy class can bring one piece of carry-on baggage, which must not exceed 22 x 15 x 8 inches (55 x 38 x 20cm), and must weigh a maximum of 15Ib (7kg). For those boarding a flight from India, carry-on baggage cannot exceed 45.3 total inches or 115cm (length + width + height). Luckily for those flying on Emirates Airlines, you can enjoy one of the world’s most generous baggage policies, with allowances of: 30kg in Economy Class 40kg in Business Class 50kg in First Class Those with Emirates Skywards Platinum Gold or Silver membership may be entitled to additional allowances. If you are flying to North America you’re allowed two bags with a weight of up to 23kg each in economy, and 32kg each in Business or First Class. Whereas Flights to South America allow two bags weighing up to 32kg each in all classes. Passengers with small children may also check in up to 10kg of additional baggage (excluding North and South America). In regards to North or South America, you may bring an additional piece of luggage weighing no more than 23kg, with dimensions not exceeding 115 cm or 45 inches (length + width + height), regardless of flight class. One carry cot or one fully collapsible buggy may also be brought as a carry-on item, if cabin space is available with no additional fees. In addition to your baggage allowance you may bring one set of golf clubs and one pair of golf shoes, free of charge regardless of flight class. Other sports equipment is subject to excess baggage charges if you exceed your baggage allowance. Items like ski equipment may also be subject to extra charges. Musical instruments are also treated as part of normal checked in luggage or cabin baggage. Aside from this it can also be transported on a paid for seat in the cabin if it is too large to be treated as hand luggage. Emirates’ aircraft are renowned for innovative technology, including becoming the first airline to introduce individual seat back videos and to enable passengers to make authorised onboard mobile phone calls. Emirates air miles are called Skywards Miles and can be collected whenever a passenger flies with Emirates, one of the Emirates partner airlines, or if they’re a customer of an Emirates leisure and lifestyle partner. Passengers will also earn 150% bonus miles whenever they fly First Class and 75% bonus miles when they fly Business Class. You can also earn miles dependant on your membership tier with Silver earning 25% bonus miles, Gold members earning 50% bonus miles and Platinum members getting 75% bonus miles. You also get 50% skywards miles with a Skywards Saver Fare and 100% with a Skywards Flex Fare. Quote your Skywards membership number when booking your flight. Children seated on an adult’s lap will travel at a discounted rate - child rates can be as low as 10% of an adult fare. Children over the age of five can travel unaccompanied via the Unaccompanied Minors scheme. Disabled passengers can request additional assistance either at the time of booking or up to 48 hours before their flight. Additional services include on board wheelchairs, facilities for sensory impaired passengers and an allowance of guide dogs. * Available on the Emirates A380. ** Chauffeur-drive mileage radius may apply. The above prices are guidelines only and are correct at the time of publishing. Subject to availability. Other travel dates are available, supplements may apply. Please use the search box or call for details. For more information please read our Pricing Terms and Conditions.